To Perform HANA Database Administration and monitoring features, SAP HANA Administration Console Perspective can be used. In Administration View: HANA studio provides multiple tabs to check configuration and health of the HANA system. Overview Tab tells General Information like, Operational Status, start time of first and last started service, version, build date and time, Platform, hardware manufacturer, etc. Single or multiple systems can be added to HANA studio for administration and information modeling purpose. 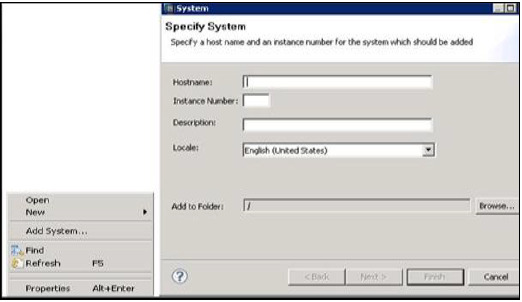 To add new HANA system, host name, instance number and database user name and password is required. To add a system to HANA studio, follow the given steps. Right Click in Navigator space and click on Add System. Enter HANA system details, i.e. Host name & Instance number and click next. 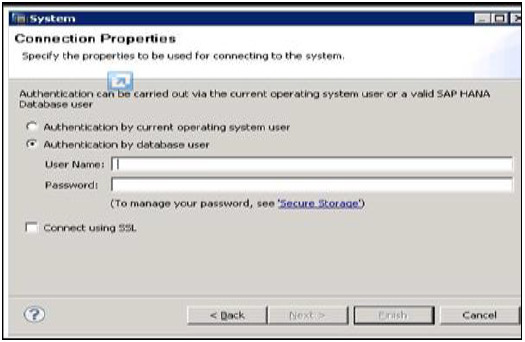 Enter Database user name and password to connect to SAP HANA database. Click on Next and then Finish. Once you click on Finish, HANA system will be added to System View for administration and modeling purpose. Each HANA system has two main sub-nodes, Catalog and Content. It contains all available Schemas i.e. all data structures, tables and data, Column views, Procedures that can be used in Content tab. The Content tab contains design time repository, which holds all information of data models created with the HANA Modeler. These models are organized in Packages. The content node provides different views on same physical data.